The engineering software is sometimes considered a fundamental part of the control system in addition to the hardware components. The core of the system, it includes various steps of the product life cycle, from the design stage all the way to commissioning and maintenance of the control system. Today, intuitive, easy-to-use software suites are expected as a standard for modern manufacturing needs. 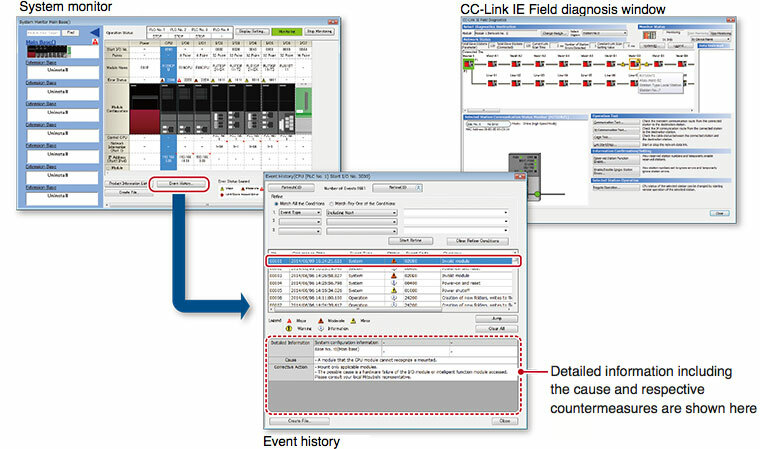 GX Works3 is the latest generation of programming and maintenance software offered by Mitsubishi Electric specifically designed for the MELSEC iQ-R Series control system. It includes many new features and technologies to ensure a trouble-free engineering environment solution. 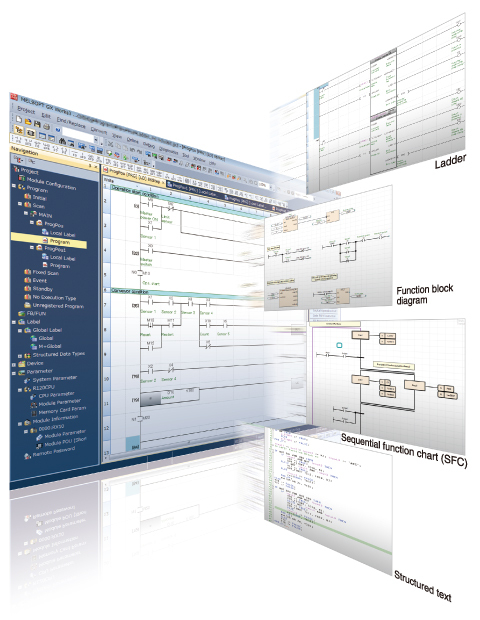 Various intuitive features such as graphic-based system configuration and an extensive module library (module labels/function blocks) provided as standard. 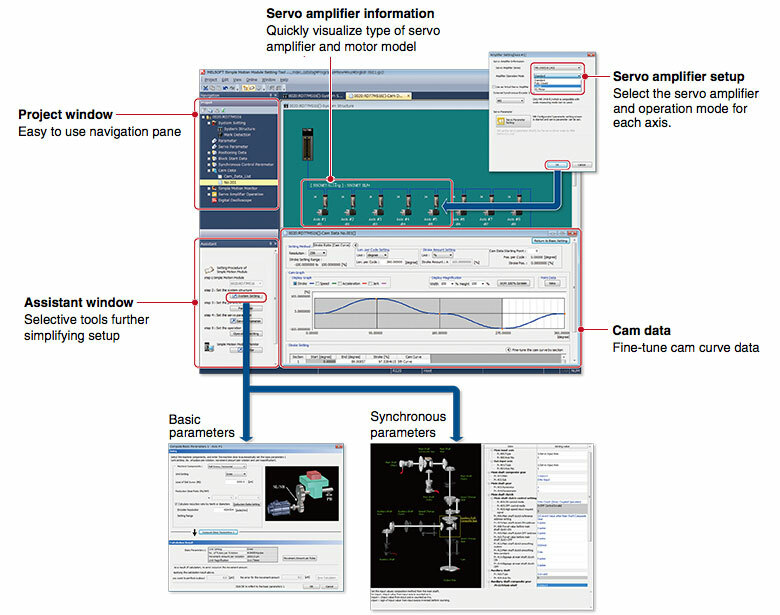 From setting simple motion module parameters and positioning data setup to servo amplifier configuration, everything is packaged into an easy-to-use engineering environment. GX Works3 realizes structured programming such as ladder and ST, making project standardization across multiple users even easier. Most projects start from system design, so having a software application that caters to this initial stage is important. GX Works3 incorporates a system design feature that enables system components to be assembled directly in the programming software. 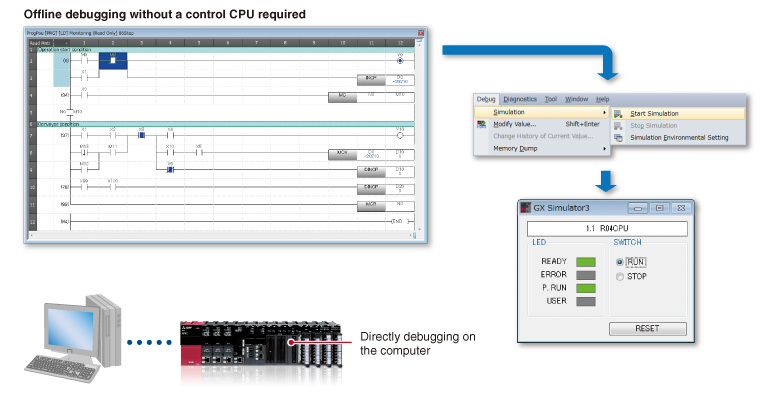 It includes a parts library consisting of MELSEC iQ-R Series modules that can be used to simplify system creation. Another useful feature is the ability to register parameters automatically. Simply double-click on the desired module and the corresponding parameters will be registered in the project. A window with an easy-to-use parameter settings screen opens, enabling module parameters to be modified as needed. GX Works3 is equipped with a special motion setup tool that makes it easy to change simple motion module settings such as module parameters, positioning data and servo parameters. Also, debugging is simplified using the fine-tuning cam data generation feature. GX Works3 comes with an updated object library pre-installed in the software consisting of a module library with current modules at time of software release although this can be added to as newer modules become available. A variety of other objects are available such as third-party partner function blocks. The library can be fully shared across multiple projects. 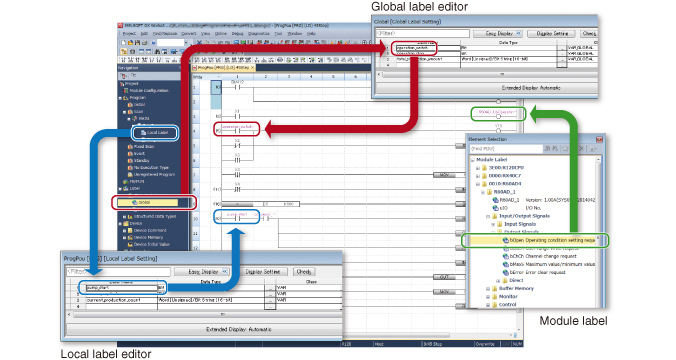 Global and local variables (labels) are supported providing an easy way to share device names across multiple projects, other MELSOFT software and third party SCADA. The variables can be registered into either the current program, function block as a local variable or within the project as a global variable to share across multiple programs within the same project. Variables specific to a particular module are also available, and can be used immediately, further reducing engineering time and cost. The main IEC languages are supported by GX Works3. Various different programming languages can be used within the same project simultaneously and can be viewed easily via the menu tab. The variables and devices used in each program can be shared across multiple platforms, with user defined function blocks supported. 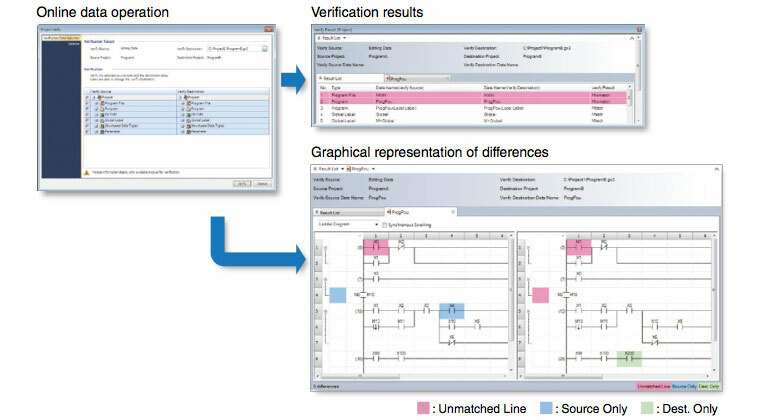 Being able to visually see and manage different versions of the same project can help to reduce debugging processes. Even with a number of engineers are working on the same project, changes made are easily recognized directly from the program or as an automatically generated verification results list. This feature is available for locally stored projects on the computer, and between the program stored in the programmable controller CPU. 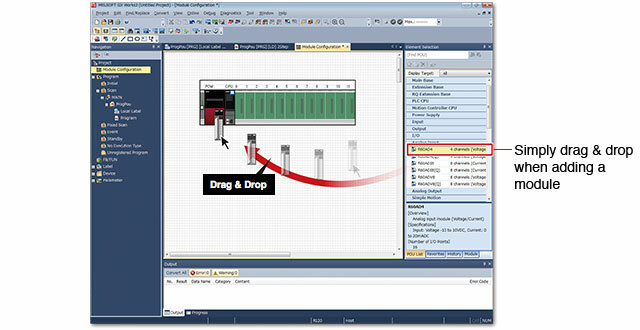 GX Works3 features an integrated simulator which helps to visualize the operation of the program during the debugging process. Motion control CPU hardware can be simulated as well. GX Works3 incorporates various maintenance features helping to reduce downtime and keep productivity high. Various levels of maintenance are possible, from system-wide monitoring of errors an module status to monitoring at the network level; for example, detailed operations that show where programs or parameters have been changed in the CPU and the monitoring of system events, which also includes a useful historical function that can be exported as a CSV file. The menu system can be switched between various languages, enabling different locations to work on the same project with the same programming software version. In addition, device comments within the project can be switched between various languages without having to create multiple copies of the same project to support the comments in different languages.